I had been playing junior league football in Sydney, with Renown United in the St.George competition, we had some success in the C and B grades. I was in the Murrumburrah Hotel one night when a couple of guys connected to the junior league club I belonged to in Sydney came through (they had a horse with them and were on their way to the races somewhere down that way). They mentioned to whoever was there that I had played junior football in the same team as Reg. Gasnier, who was making a name for himself at the time. After that I was approached to have a game, which I did, and the rest is history. In Sydney I had been playing lock, but as the captain coach Matt Grenfell was the Harden lock, he played me in the centres. All up I think I played in six games in both Group 9 and the Maher Cup before having to return to Sydney. I remember the following games: Sunday 17 May against Barmedman, won 19-8; Sunday 24 May against Boorowa; Maher Cup 30 May against Coota 17-8; Sunday 31 May v Junee 40-7; and 6 June Maher Cup aganst Gundagai 10-3. I was only a team player (no star) I enjoyed playing and hope I contributed in a small way to the teams success at that time. It was not until many years later that I was made aware of what I had been part of, and how good that team was. On 13 September 1958 Harden won the Cup from Wyalong and defended it for the entire 1959 season – continuously for some 27 Saturdays until 2 July 1960. This is an all time Maher Cup record. Of course the team had also to back up for tough Group 9 games every Sunday. When Kevin Day was in Murrumburrah it was in the relatively early days of that incredible run. 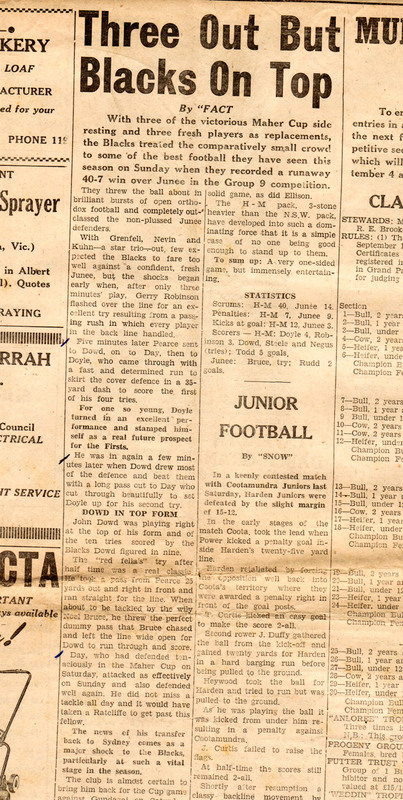 Below are two clippings from the Harden-Murrumburrah Express of 4 June 1959. This entry was posted in People, Places and tagged Harden-Murrumburrah, Kevin Day. Bookmark the permalink. 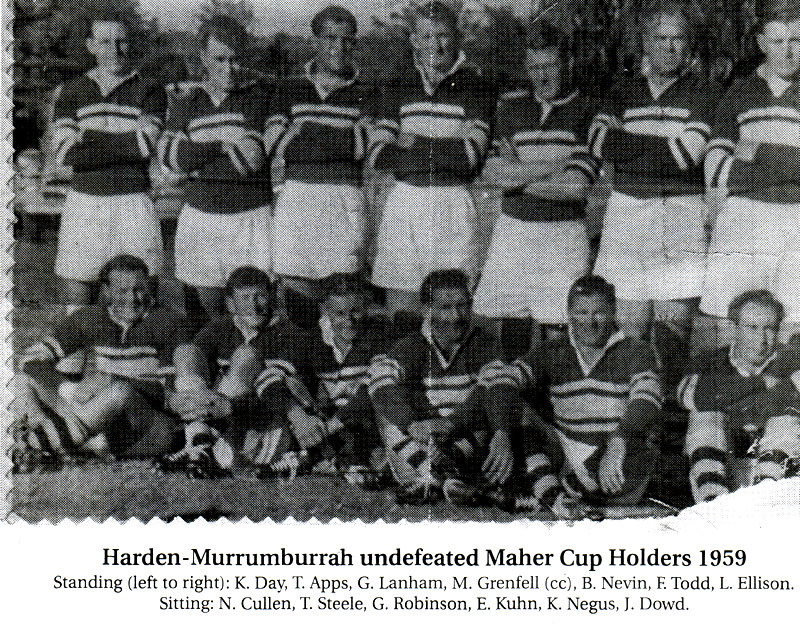 Have you seen my Maher cup book …the harden-Murrumburrah story ? Hi Merv. 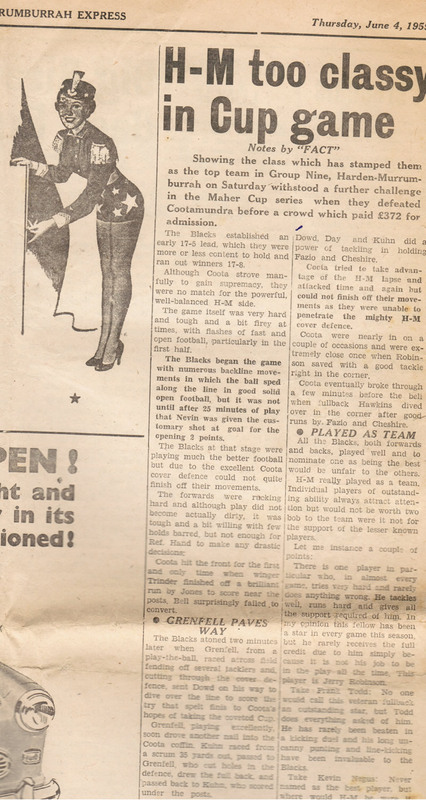 Yes Fred, also known as Froggy, Woods played at least 16 Maher Cup games for Harden from 1952-1959 usually in the 2nd row, although he also played lock and in the centres. There are four team photos in which he is represented in Paul McCarthy’s book – The Maher Cup: The Harden-Murrumburrah story. I was playing Bb Bass in the Harden Brass Band in 1959 and each Saturday we marched from the Railway Institute up the Main Street then round to McLean Oval where we marched around the oval and were allowed to sit on the sideline to watch the game. We played at half-time then when they won we played the Victory March back to the Band room. Then it was over to Mrs McLean’s Grand Hotel for a couple of beers before 6 o’clock closing.